Get your crew together, it's time to take the obstacle course challenge. These awesome inflatable challenge courses offer players a chance to test their skills against multiple obstacles. Browse the descriptions for a variety of elements and see which might work best for your attendees. Great for all ages to compete or run individually. Click the link or image for more information. 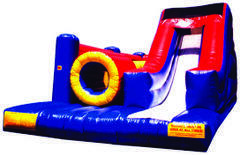 Base Price is shown for inflatable obstacle course parties up to 4 hours long. Price is AUTOMATICALY increased by $100 for parties 5-8 hours long. 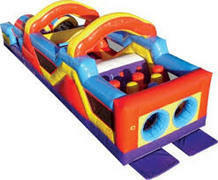 The max rental time on inflatables is 8 hours unless another time was agreed upon by our sales manager. Thanks, your friends at Lotza Party.